BBL Championship runners-up Leicester Riders and defending champions Worcester Wolves were knocked out in the opening round of the BBL Play-offs. 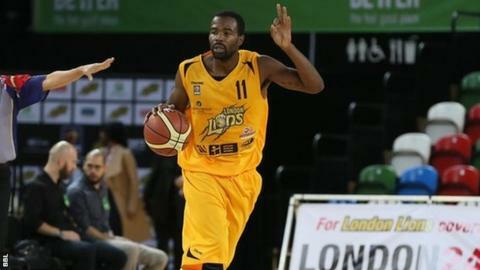 Riders were beaten over two legs by Sheffield Sharks while Wolves were thrashed by London Lions. Newcastle Eagles, who finished top of the Championship, progressed at the expense of BBL rookies Bristol Flyers. Cheshire Phoenix booked their place in the last four, despite losing the second leg against Glasgow Rocks. "I've never looked at the scoreboard so much in my life," said Phoenix coach John Coffino. "Credit to my players, we had a chance to win the game, down one, and they held onto it to give Glasgow the win on the night. "The fact that they did that was really classy from our players." Riders lost the first leg in Sheffield 79-68 as 2010 league MVP Mike Cook scored 25 points, meaning Leicester required a 12-point victory at home to advance. Rob Paternostro's side led by 13 with 14 seconds to play, only for Nick Lewis to force overtime before Sharks completed the job in the added period. Zaire Taylor, 2014 Play-off final MVP, scored 41 points against his former club on Sunday as Lions routed Wolves 106-67, having won the away leg 80-75. Phoenix's 91-78 win in their first leg away at Glasgow gave them a good cushion going into Sunday's return, and despite a valiant effort from Rocks, with 18 points each from Tommy Freeman and Danny Huffor, Coffino's men progressed. BBL Championship, Cup and Trophy winners, Eagles, remain on course for a second clean sweep, following a comfortable 32-point aggregate success against Bristol Flyers. Eagles will face Sharks in the semi-finals, a re-match from the same stage last season, while Phoenix face Lions, with ties due to be completed this week.